The rat-hole mine, located on top of a hillock fully covered with trees in East Jaintia Hills district, had got flooded when water from the nearby Lytein river gushed into it, trapping the miners. NEW DELHI: The Supreme Court on Wednesday agreed to hear on Thursday a plea seeking urgent steps to rescue 15 miners trapped inside an illegal coal mine in Meghalaya since December 13. Rescue operations at the site in Khloo Ryngksan village have been going on for nearly three weeks, without any success. During the brief hearing, a bench headed by Chief Justice of India Ranjan Gogoi agreed to hear the PIL on Thursday. The PIL filed by Delhi-based lawyer Aditya N Prasad also sought a direction to the Centre and other authorities concerned to prepare a Standard Operating Procedure (SOP) for rescue operations in mines. The plea said arrangements should be made to airlift equipment offered by private players like Kirloskar Brothers Ltd. and Tata Trusts to pump out water from the mine. The rat-hole mine, located on top of a hillock fully covered with trees in East Jaintia Hills district, was flooded when water from the nearby Lytein river gushed into it, trapping the miners. Rat-hole mining remains rampant in various districts of the north-eastern state despite a 2014 ban by the National Green Tribunal. In 2012, 15 miners lost their lives in a disaster and their bodies couldn’t be found. Rat-hole mining involves digging of narrow tunnels for workers to enter and extract coal. Last week, a team of Navy divers joined the operation and went down the shaft of the mine and searched for the miners for about two hours without success. 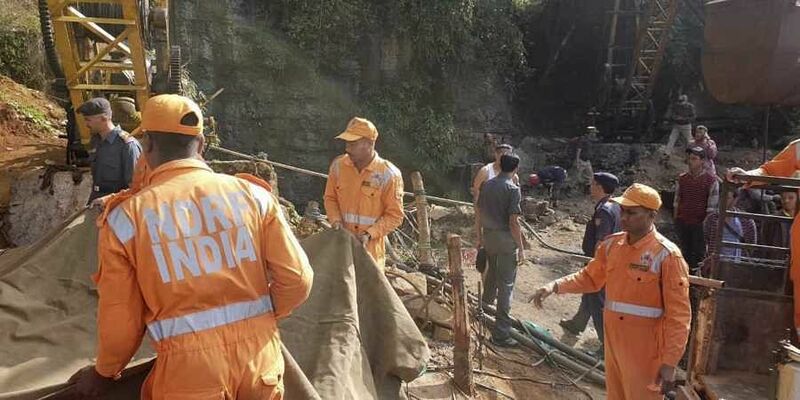 There was little headway on Wednesday in the operation by multiple agencies to rescue at least 15 miners trapped inside a 380-feet-deep illegal rat-hole coal mine in East Jaintia Hills of Meghalaya since December 13. According to official sources, the level of water in the old shaft, which is located a few yards from the main shaft, was reduced by 16 inches following pumping by the Odisha Fire Service. The abandoned old shaft and the main shaft are interconnected underground. The level of water in the main shaft is said to be in excess of 150 feet and the visibility is poor. The agencies are working to bring it down to 30 metres.